Norfolk Island is a quaint - almost quirky – forgotten corner of Australia. And that's a huge part of its appeal. I went back recently, after not having visited for over a decade. It was a sweet reminder of how naturally beautiful Norfolk is. Not a lot has changed and, in today's world, that can be pretty appealing. If you're lucky enough to score a left-side window seat on the plane you see the lush, green swathe of island from a distance & then descend over crescent-shaped Emily Cove beach and Kingston, the original British colonial penal settlement. It's an exhilarating snapshot. Founded shortly after Governor Phillip established Port Jackson in 1788, Norfolk Island was meant to be both a supply base & maxi-prison for Sydney. It didn't work on either count but the mix of abandoned sandstone barracks, old port buildings & a row of exquisite Georgian houses – including the Chief Minister's – may be the greatest collection of its type anywhere in the world. Norfolk Island is quite different to the stark remnants of Port Arthur in Tasmania but its history is just as violent & barbaric, the ghost tales just as colourful, I suspect. The whine of a chill wind through the pines on a pitch-black night - beyond the dismantled gallows and the old graveyard, with Bloody Bridge at your back is enough to frighten the pants off a scarecrow, I suspect.I once had a war–hardened 60 Minutes cameraman refuse to spend an hour amongst the tombstones at night, even though we collectively offered him two hundred dollars incentive. " Stick that up your ***!" he told us, as he headed for a well-lit bar downtown. Mind you " downtown" is not much more than a mixed assortment of one-story shops, the occasional cafe, the RSL club, a couple of bowling greens & the pub. That's pretty much the charm of the place. Not forgetting the metal-boat memorial to The Bounty. It's a reminder for Norfolk Island's population of their ancestors who took refuge here in 1856, when they'd outgrown Pitcairn Island, 3700 miles away in the far South Pacific. 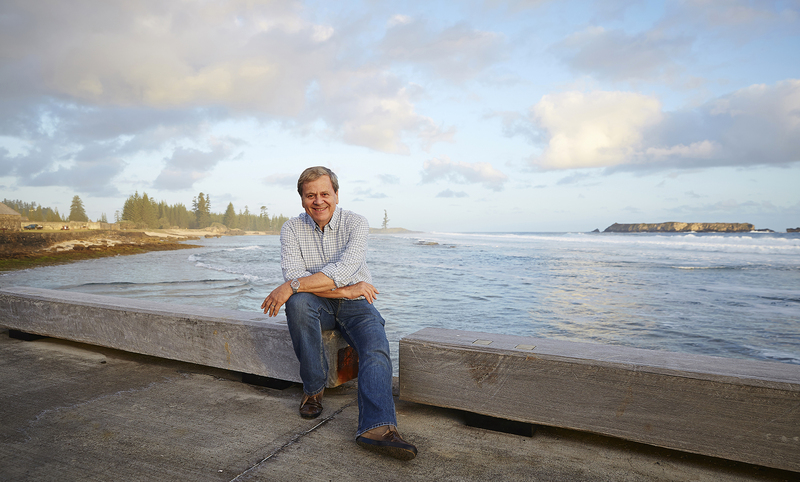 The family connection with Fletcher Christian & his mates thrives on Norfolk Island today, as every second local you meet has the spirit of The Bounty mutineers in their blood. Literally. They're a friendly, colourful mob who naturally say 'G'day', as people always did. Beyond the rogues and rascals of colonial days I found a lot to soak up as I drove my bright orange Mini Moke hire-car (great fun for a holiday) around the island's narrow lanes – mindful of the road rules that require you to always wave to passers-by and give right-of-way to cattle. No traffic lights and one lonely roundabout make touring a breeze. Norfolk Island is a foodies treasure trove, driven - like Tasmania and New Zealand - by its clean' n' green reality. Cleanest air & water, with the greenest pastures - in a world where cities face blinding pollution & farmlands are laced with toxic chemicals. There's home-grown beef and lamb and chickens aplenty – with colourful feral roosters running freely, unbothered. Plenty of fruit & vegies too, with what the Norfolk 'folk' claim is 'the world's best avocado'. Maybe it is, too. While there's no shortage of New Zealand or Aussie wines there's only one vineyard - and one goat farm. They both offer the most delicious picnic hampers of succulent local cheeses, breads & spreads, to take to your own private paddock or cliff-top - and indulge! Similarly, restaurant chefs are mostly dependent on the island's seasonal crops. Local fish are plentiful, either at the wharf as they unload the day's catch or from a line you've cast yourself from a hired boat. I much prefer the latter option. For golfers, the locals lay claim to having the world's only public course on 'heritage listed' land. (The whole island has proudly been World Heritage listed.) Even if it's not the only one in the galaxy, it's still a gorgeous nine-hole course that will certainly test your skills when the sea breeze rocks in. Hiking trails seem to be endless, to secluded beaches and through seductive forests, including a copse of magnificent Morton Bay fig trees with an above-ground root system big enough to house an itinerant family. Obviously planted here in the earliest colonial days, I've never seen anything like these natives, in size or stature. Join the Colleen McCullough tour to visit her house and study, where Australia's best-selling female author wrote her extraordinary novels, surrounded by a conflagration of wildly coloured walls and tiles and chairs. Colleen's taste in furnishings was as loud as her personality. Although going to Norfolk Island means turning back the clock to a quieter, more relaxed era, don't let anyone tell you that this lovely place is strictly for retirees or your grandparents. That's utter nonsense. No matter what your age, or the age of your kids, it's a place that can be as ' full on' as you want to make it - great for hyper-active families, honeymoon couples or a long weekend, just finding yourselves again. Finally, if you like to take photos – which happens to be an obsession of mine – well, grab some extra batteries for the camera. Sunrises and sunsets on Norfolk Island are spectacular while the night skies are simply breathtaking. If I sound a bit besotted by the place, well I am. I even signed-on as an Ambassador. I really do think that Norfolk Island is one of Australian tourism's best-kept secrets. So, c'mon. Do yourself a huge favour. It's a little part of Australia, after all.